Today, Microsoft announced the Azure IoT Suite is available to purchase. Built on the trusted Azure cloud platform, the Azure IoT Suite brings together preconfigured offerings to enable companies to quickly and easily develop and deploy Internet of Things solutions. 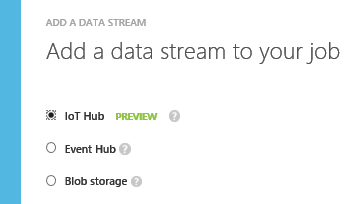 Support for IoT Hub input: Stream Analytics jobs now have a Preview feature to ingest data from Azure IoT Hubs, enabling real-time analytics over millions of events from all of your connected devices. 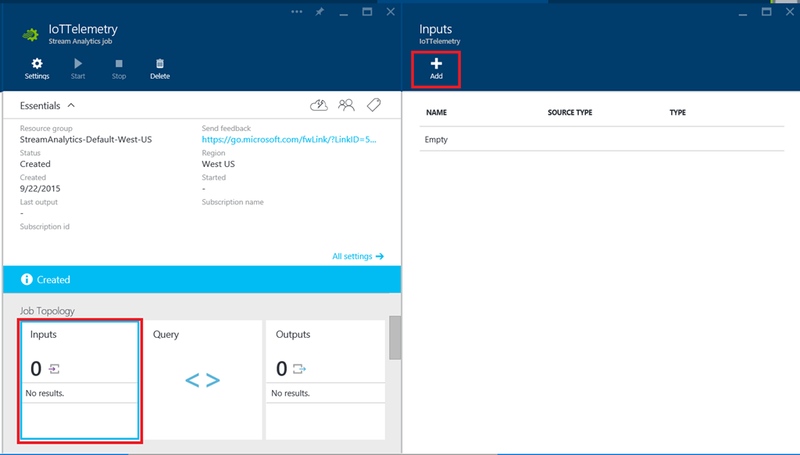 Azure Preview portal integration: In addition to continued presence in the Azure Management portal, Stream Analytics is now integrated in the Azure Preview portal. Support for DocumentDB output: Stream Analytics jobs can now output to Azure DocumentDB, enabling data archival and low latency querying for unstructured JSON data. TIMESTAMP BY for heterogeneous events: When a single data stream contains multiple event types having timestamps in different fields, you can now use TIMESTAMP BY with expressions to specify different timestamp fields for each case. In this blog post, we will dive into the IoT Hub integration, which enables you to unleash the power of real time analytics to gain insight over millions of events from all your connected devices. Now customers of Stream Analytics can perform real time analytics over data brought in through Azure Event Hubs, IoT Hubs and Azure Blobs. IoT Hub is a fully managed service that enables reliable and secure bi-directional communications between millions of IoT devices and an application back-end. Azure IoT Hub offers reliable device-to-cloud and cloud-to-device hyper-scale messaging, enables secure communications using per-device security credentials and access control, and includes device libraries for the most popular languages and platforms. In the Azure Preview portal, create a new Stream Analytics job. Stream Analytics is found under the Data + Analytics category. Click Inputs, then click Add in the Inputs blade. Select Data stream as the Type and IoT hub as the Source, and enter connection information about the IoT Hub such as the endpoint and shared access policy and key. 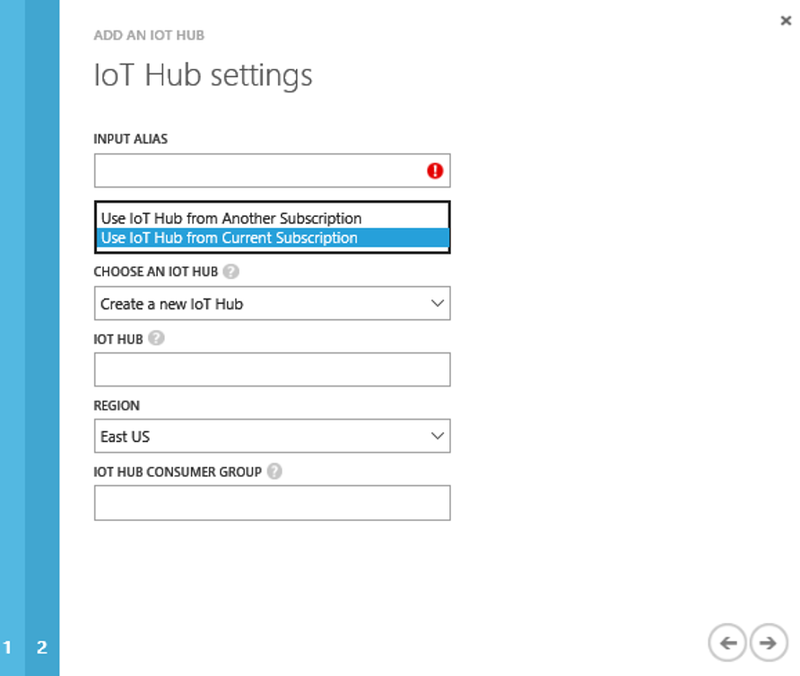 Details on specific IoT Hub properties can be found here. 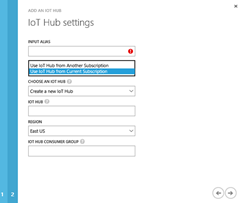 Stream Analytics remains fully supported in the Azure Management portal and you can connect your Stream Analytics job to in IoT Hub input by either selecting an existing IoT Hub from your subscription, creating a new IoT Hub, or selecting an IoT hub from another subscription. To learn more about Stream Analytics, visit the Stream Analytics Learning Path. We look forward to hearing your feedback on the Stream Analytics Forum and Azure Feedback Forum. Stay tuned for more product updates coming soon!